1 Promax mini-bar. I was hoping to get something different at a wellness week healthy breakfast event this morning, but apparently they ran out of everything except cereal when I had gotten there. I was in a rush to get to lab, so I just poured some frosted cheerios into a ziplock bag for snacking on later. The Promax bar did a good job of tiding me over until lunch though, especially considering that it is only 1/4 the size of a normal protein bar. 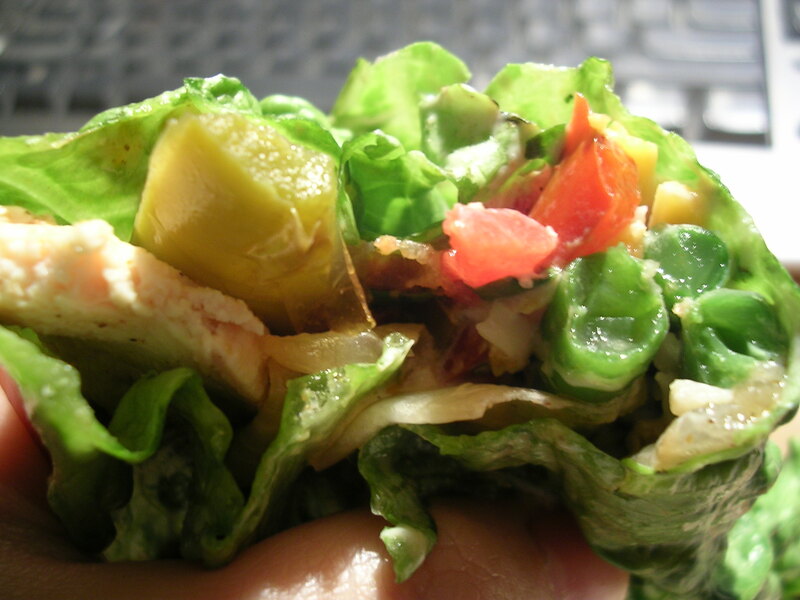 1 entree of chicken fajitas, eaten as lettuce wraps. 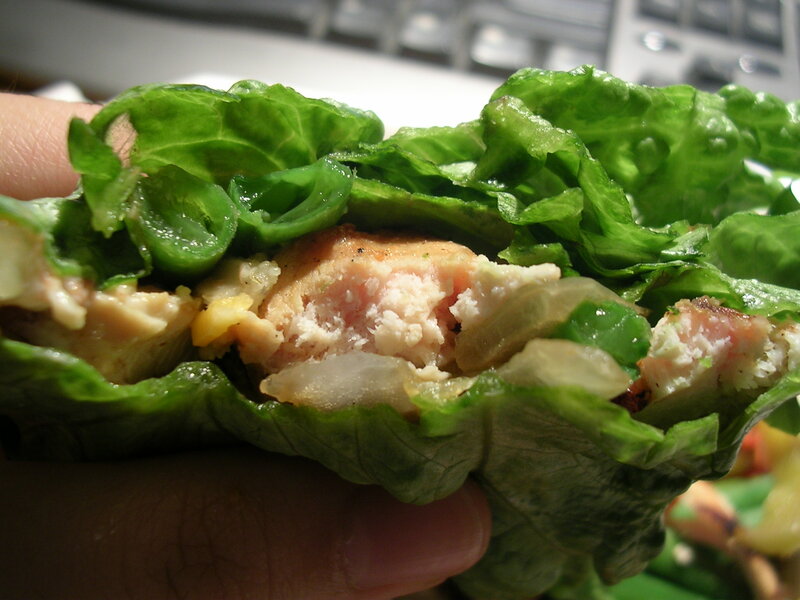 I love chicken fajitas, but seeing the flour tortillas that came with the entree made me a bit sad, so I decided to have some fun by making them into lettuce wrap chicken fajitas! And boy were they tasty as ever! The fajita fillings were given to us separately, so that we could fill our own fajitas to our liking. It came with 4 oz. 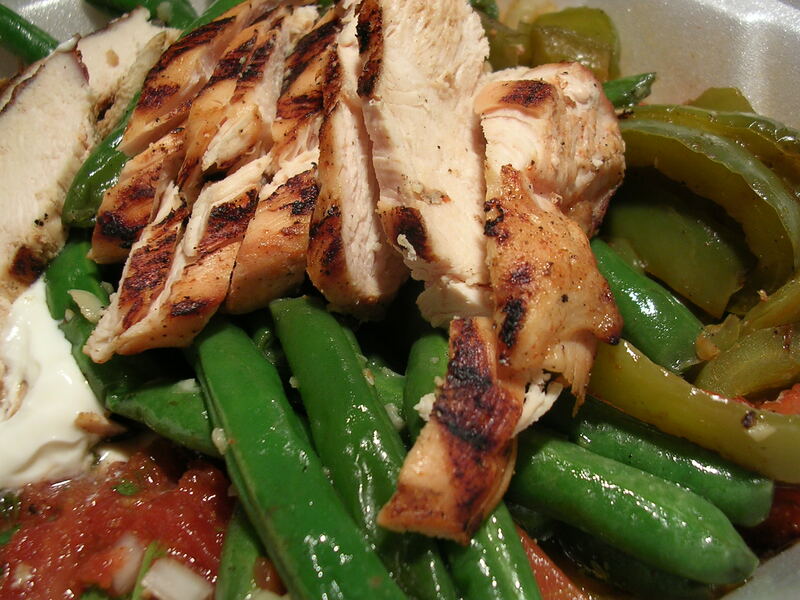 of grilled chicken, grilled bell peppers and onions, salsa, sour cream, shredded cheese, and a side of Spanish rice. I substituted the rice with a side of garlic sauteed green beans (much tastier than Baker's regular steamed green beans!). Then I proceeded to fill my entree box with the largest leaves of lettuce that I could find at the hamburger condiment station. Here are the fajita fillings. Mmm! Dinner complimented with 1.5 bottles of water (25.5 oz). 1/2 bottle of water (8.5 oz). 30 minutes on the elliptical, 10 minutes of stretching. Post-workout snack: 1 oz. of roasted unsalted almonds, with 1.5 teaspoons of honey, and 1 bottle of water (17 oz). 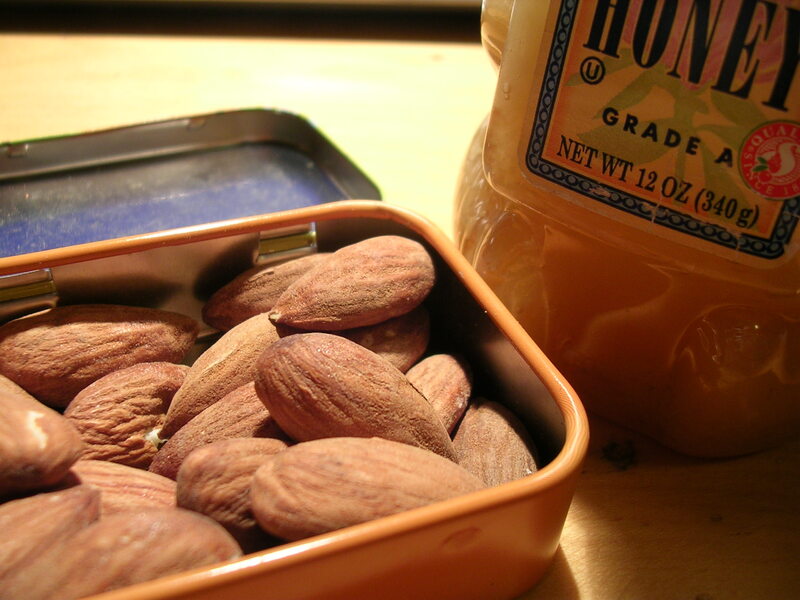 I was thinking how weird it is that I was eating almonds smeared with a little bit honey and really really enjoying them, then I remembered that honey roasted almonds are a popular item, so duh it makes perfect sense. Dunno why I never see people eating them this way though. This entry was posted on Tuesday, May 1st, 2007 at 12:13 am	and posted in beverages, Italian, Mexican, poultry, rice and pastas, snacks, Uncategorized. You can follow any responses to this entry through the RSS 2.0 feed.